Chameleon pens bring color control and simplicity to your art. Create stunning 3D effects, smooth transitions, highlighting, shading, gradations and blending- all with one pen!! One marker fits together in 2 parts- a dual tip pen with colored ink -and- a mixing chamber with blending solution. 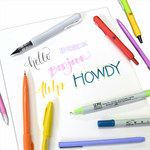 Use each tip of the marker individually for regular coloring OR leave the middle cap off when you put the halves back together- allowing the blending solution to soak into the colored tip of the marker. Then when you color, the intensity of the ink color gradually darkens- making it super simple to color in gradation!